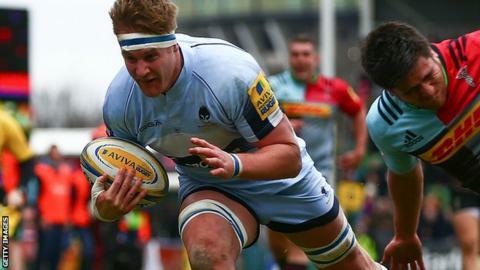 Worcester made it three Premiership wins in a row for the first time since March 2007 with victory at Harlequins. First-half tries from centre Wynand Olivier and an opportunist score from captain GJ van Velze gave the Warriors an 18-9 lead at the break. A cagey second half saw few clear openings for either side as Ben Botica and Tom Heathcote exchanged penalties. Harlequins missed the chance to climb into the top four while Worcester now look almost sure to avoid relegation. The Warriors' sixth league win of the season took them to 30 points - 17 ahead of bottom-placed London Irish, who host Gloucester on Sunday. Controversy surrounded van Velze's try towards half-time when an assistant referee appeared to raise his flag on the halfway line for a Worcester line-out. Harlequins winger Henry Cheeseman had just managed to stay in touch and the assistant quickly lowered his flag. Some players stood still and waited for the whistle, but Worcester's Van Velze took advantage of both the loose ball and the sudden space to race clear unopposed. Referee Craig Maxwell-Keys let the try stand, but Quins never recovered from the setback. Conor O'Shea's side failed to find a way through a stubborn Warriors defence and Botica's five penalties were all they had to show for their efforts. Falcons on the receiving end again . . . The only previous time Warriors have won three games in a row in the Premiership was in March 2007 when they won 21-12 at home to Bath, 18-12 at Sale and 23-21 at home to Newcastle. This time round, their three victories have been against Newcastle (again), 15-14, Gloucester (28-20) and Quins. "It's been an eight-week window and been massively difficult for the players. It's been a one-off, but we'll still fight to the bitter end. "We have loads of injuries but we'll get our international players back and give it a real go at Northampton next week." "It shouldn't have been given; the touch judge put his flag up. It's tough to take and I'd like the officials to own up to their mistake. "However, it's not the reason we lost as Worcester had a full strength team and were the more accurate." "The try was given immediately by the referee and it wasn't pivotal to the game. "We frustrated them and we were good defensively against the best attacking team in the league. But we had a few opportunities, which we didn't take. "It wasn't one of our best performances. But we've stayed confident. We want to take this club in a different direction." Harlequins: R Chisholm; Walker, Lowe, Sloan, Cheeseman; Botica, Dickson; Lambert, Ward, Sinckler; Horwill (capt), Twomey, Luamanu, Wallace, Easter. Replacements: Gray, Evans, Collier, Matthews, J Chisholm, Tebaldi, Marchant, Lindsay-Hague. Worcester: Pennell; Heem, Olivier, Mills, Biggs; Heathcote, Hougaard; Rapava Ruskin, Annett, Schonert; O'Callaghan, Barry, Dowson, Kirwan, van Velze (capt). Replacements: Betty for Kirwan (57), Symons for Mills (60), Leleimalefaga for Rapava-Ruskin (62), Johnston for Schonert (66). Not Used: Sowrey, D Sanderson, Baldwin, Lamb.